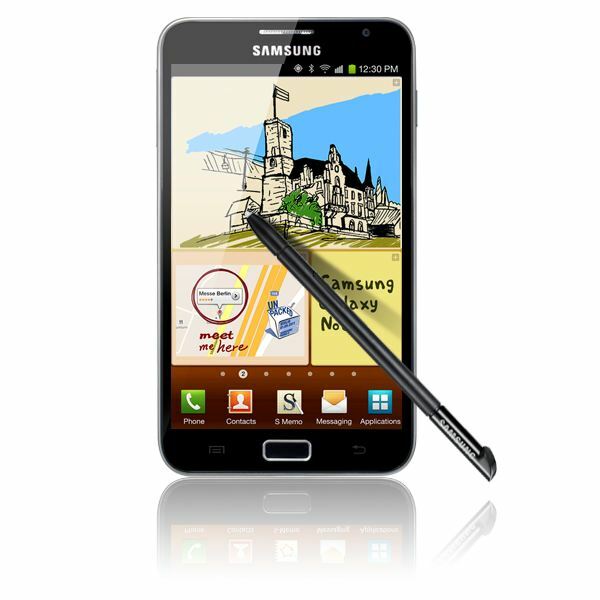 The Samsung Galaxy Note is essentially a cross between a smartphone and a tablet. Thanks to the inclusion of the S Pen (which is basically a stylus) it will also serve you well as a notepad, as the name would suggest. The gigantic 5.3 inch display is gorgeous, it’s a powerful device and the battery life is reasonable. If you can get away from the comedy prop look when you hold it up to your ear for calls then it might just be the device for you, and remember you can always use a Bluetooth headset. This is a big device if you are primarily thinking of it as a smartphone. It measures 5.78 x 3.27 x 0.38 inches (146.85 x 82.95 x 9.65 mm) and it weighs 6.28 ounces (178 g). It looks a lot like a body-building Samsung Galaxy S II on steroids, but considering the size of the display it is actually very thin and light. That 5.3 inch Super AMOLED capacitive touch screen is absolutely the star of the show and it has an 800 x 1280 pixel resolution at 285 ppi. It looks fantastically vibrant and sharp. Everything looks great on this display. Just like the Galaxy S II you have a silver highlighted physical home key at the bottom of the display with a backlit touch-sensitive menu key on the left and a back key on the right. The rest of the layout is pretty standard with a power/lock key at the top of the right spine, the 3.5 mm headphone jack on the top edge, a volume rocker on the left and a micro USB port on the bottom edge. You’ll also find the silver-topped S Pen slides out of the bottom. It looks like a normal stylus, but it does have a button on the side for extra functionality. The textured plastic backing provides a bit of grip and you can see the 8 MP camera and LED flash at the top. It actually feels quite comfortable to hold, but it’s obviously not quite as portable as most smartphones. You aren’t going to be sliding the Note into the front pocket of your skinny jeans. It is also hard not to feel a bit silly if you hold the phone up to your ear for making calls. The Note is running Android 2.3.5 with Samsung’s TouchWiz on top. It would obviously benefit from Android 4.0 Ice Cream Sandwich and apparently it will receive an update, but there’s no word on exactly when. The interface is easy to use and you have the choice of using the S Pen for more precise control. There are the usual seven home screens with plenty of customization options and there’s plenty of room for shortcuts and widgets. The pull down notification bar includes a nice shortcut menu for things like Wi-Fi, Bluetooth and Silent Mode. It runs very smoothly without the slightest hint of lag. 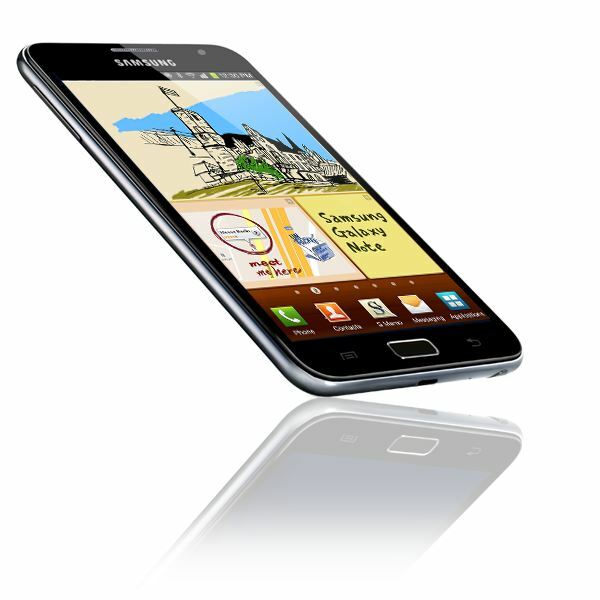 The Note has a dual-core 1.4 GHz processor, 1 GB of RAM and it comes in 16 GB or 32 GB internal storage varieties. There’s also a microSD card slot so you can expand that by up to 32 GB. It supports HSPA+, LTE, EDGE and GPRS networks so you are well-placed to get the best speeds possible wherever you happen to be. You’ve also got A-GPS, Bluetooth 3.0 and Wi-Fi 802.11 b,g,n. The main camera is an 8 megapixel shooter and it is capable of recording 1080p video at 30 FPS. There’s also a front facing 2 megapixel camera for video calls. There’s a LED flash, but the camera app is pretty basic in terms of features and the autofocus can take a while to find the right level. Shots mostly turn out well but, as is so often the case, the camera doesn’t perform so well in low light conditions. The video recording is good quality, but the audio doesn’t match up. If you’re buying a phone like this then chances are you want to enjoy some entertainment on it and take advantage of that display. For video it supports the MP4, M4V, Xvid, DivX, AVI, and 3GP formats. For best results you can stream the audio to a Bluetooth headset. This is a great device for watching movies. It is also good for listening to music on, although everything sounds better through a headset. You’ve got DLNA support for streaming content. The Note is also fantastic for web addicts and browsing is an absolute pleasure. Speeds depend on your connection but it generally loads pages fast and you can enjoy full version websites with Flash. The S Pen is another special feature on the Note and there are a few dedicated Samsung apps to help you get the best from it. S Memo allows you to sketch or write with ease and you can share your notes. The S Pen also offers some gesture shortcuts. You have the ability to hold the stylus button and double tap the screen to bring up a notepad – this ties into the S Memo app. You can also tap and hold the screen to capture a screenshot and it immediately opens in an image editor so you can add notes or diagrams if you want to. It does work really well as a notepad for capturing thoughts on the go and everything you create is easy to share through the usual social networking and messaging options. The call quality is excellent and the speakerphone is really loud too. The only stumbling block for calls is the size of the device, but it works perfectly. The Note is packing a huge battery rated at 2500 mAh. Of course it needs to because of that giant display. Battery life inevitably depends on how much you use the device and what you use, but it should see you through the day on normal use. If you use it a lot then you’ll probably want to charge it every night. The big selling point for the Note is the gigantic screen. It is also extremely powerful and fast. 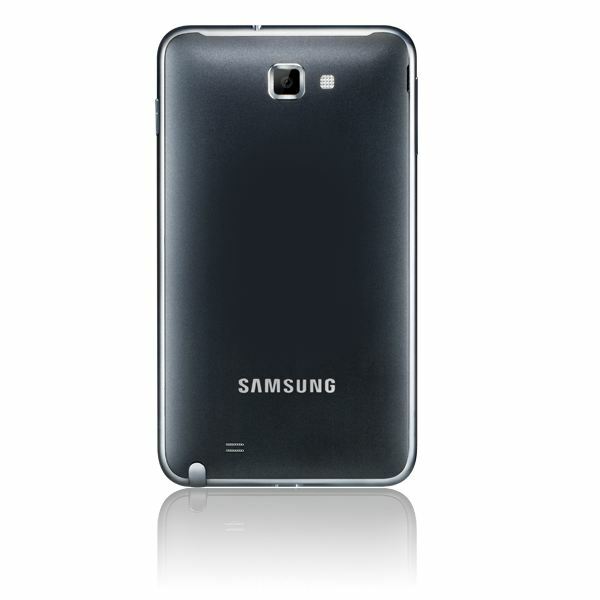 In fact the Samsung Galaxy Note is a high-end device in every respect. It also features a price tag to match and it is liable to cost somewhere over $800. Obviously carriers will offer subsidized deals with contracts. This is an awesome device if you don’t mind having something so large as your smartphone.